I had to estimate quite a few years because I didn’t always keep records, but I did run every year since my junior year in High School. I started running then because my football coach suggested I try another sport. I was only 5’2” at the time and weighed about 120 pounds. I weigh less than that now. My best time in High School was a 4:37 mile and in Junior College I got that down to 4:16. At California Fullerton State University Fullerton (CSUF) I didn’t improve my mile time but found I was better at longer distances, running the three mile in 13:42, six in 28:52 and a marathon in2:17:45 (Mission Bay). Those times happened after I started running high mileage while at CSUF. One of my teammates told me Dave Bedford ran 200 miles/week and I decided to give it a try. 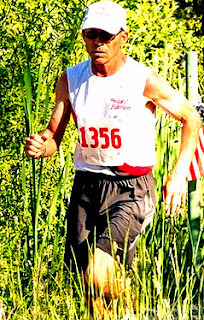 For three years I maintained a better than 20 mile/day average, running 7,286 miles in 1971, 7,288 in 1972 and 8060 in 1973. My biggest month was December, 1973 when I ran 884 miles. I believe most of these miles were run in at least 6 min/mile or better pace. I especially remember one training run of 32 miles with Dave White and other CSUF runners. We passed the 26 mile mark in 2:27 (measured by Dave’s VW).